Limerick Diocesan College, under the Patronage of St. Munchin, was founded by Most Rev. John Young, Bishop of Limerick in 1796. After many changes, it is established here by Most Rev. Henry Murphy, Bishop of Limerick, who placed this foundation stone on 28th April 1960. Thus reads, in English translation, the inscription to be seen on the foundation stone of St. Munchin’s College, Corbally, Limerick. St. Munchin’s College is the Diocesan College of Limerick. It is an institution of learning with a long and noble history, stretching back over 200 years. In this time, St. Munchin’s College has indeed seen many changes, both of organisation and location, however, its dedication to Christian Education, sound moral ideals, and high academic standards has not changed. The Diocese of Limerick was formally established at the Synod of Rathbreasil in the year 1111. The boundaries of the diocese as arranged at that time have practically remained unchanged to the present day. The diocese includes most of County Limerick, and two parishes in County Clare. The patron saint of the Diocese is Saint Munchin; tradition holds that St. Munchin was the first bishop of Limerick and he founded a cathedral which remained the principal church of the diocese until Donal O’Brien, King of Limerick, built St. Mary’s Cathedral in the 12th Century. For many centuries Irish Theological Schools had been suppressed and the students for the priesthood had to be educated outside Ireland. Many famous Colleges for the education of priests were established on the continent-Lisbon, Salamanca, Paris, Louvain and Rome to name just a few. However, by the end of the 18th century, circumstances had changed. Firstly the effects of the French Revolution had closed many of the seminaries abroad and secondly, the attitude of the government to the education of the Catholic clergy had changed. A bill to provide for the education of the Catholic clergy received the Royal Assent on June 5th 1795. The Duke of Leinster offered a site at Maynooth, Co. Kildare, his offer was accepted and, on October 1st, 1795, St. Patrick’s College at Maynooth was formally opened. At this time, in most Irish Dioceses, preparatory seminaries were established, among them St. Munchin’s College, Limerick. The driving force behind the establishment of the new college was Bishop John Young. On September 29th 1796 St. Munchin’s College was opened at Palmerstown in Limerick City. The curriculum was made up of Logic and Divinity. It was a major seminary for those pursuing studies for the priesthood. It was some years before St. Munchin’s took the form of a Diocesan College, that is, an educational institution in which both laymen and future priests pursue their secondary studies together. The first of many changes in location was not long coming and, within six months, by March 1797, the College moved from Palmerstown to Newgate Lane, where it would remain for only three years. The next site was at Peter’s Cell and, by 1809, it was on the move again, this time to Park House in Corbally. In 1825 the College at Park House closed but, its last President, Dr. Carey, opened an Academy in Mallow Street. The Academy was opened to lay students as well as students for the priesthood. A fully fledged St. Munchin’s College was opened again in 1853, under the patronage of Bishop Ryan. The College, known as St. Munchin’s Diocesan Seminary was located at No. 1 Hartstonge Street, and the College authorities were very proud of the facilities that were available. A wide range of subjects was on offer, including Music, Drawing, Painting and Dancing. A major change in the running of St. Munchin’s took place when Bishop Ryan decided to remove the diocesan clergy from the college. This, it would seem, was due to the fact that ‘………… the priests of St. Munchin’s had paid too much local attention to a local election’ (Archdeacon Begley – Diocesan Historian) Bishop Ryan approached the Society of Jesus (Jesuits) with a request to take over the administration of the College. After formal negotiations were successfully concluded between the Bishop and the Society of Jesus, both in Ireland and in Rome, St. Munchin’s College became a Jesuit-run school on 10th March, 1859. This wasn’t the first venture into education by the Jesuits in Limerick. In fact, their first school in Ireland was set up in the Parish of St. Mary’s in Limerick in 1593. One of the first pupils to enter the Jesuit-run St.Munchin’s was Edward Thomas O’Dwyer, later Bishop of Limerick (1886-1917), a man of great learning and deep convictions. He was particularly interested in education and would, as Bishop, take a great interest in the development in St. Munchin’s. From 1859 to 1862, the College continued to grow and develop at its location in Lower Hartstonge Street. In 1862, the Jesuit Order purchased Crescent House and, on September 9th. 1862, the new College was opened with fitting ceremony. In 1871, Bishop Ryan decided to re-establish an educational institution, staffed by Diocesan clergy, and directly under the control of the Bishop. The parting of the educational ways between the Jesuits and the Diocese was fairly amicable. The Jesuit College continued under the name ‘St. Munchin’s College’, while the new college took the title ‘Diocesan Seminary of Limerick’. This new college was located in the building at No. 1 Harstonge Street. Within a few years, this college had developed a high reputation for the quality of its examination results. ‘During the past school year as many as twenty-five students passed for the ecclesiastical colleges, attorney’s apprentices, Apothecaries Hall, and the College of Surgeons’. In 1873, the Jesuit Fathers dropped the name ‘St. Munchin’s in favour of the title ‘Sacred Heart College’, located at The Crescent, the school became more commonly known simply as ‘The Crescent’. Now the name ‘St. Munchin’s College’ reverted to the school run by the Diocese. For six years, 1882 to 1888, the official Diocesan seminary was located at Mungret, firstly under the administration of Diocesan clergy, notably Fr. Joseph Bourke and, later under the direction of the Jesuit fathers. The excellence of the eduation provided at Mungret can be seen in that all six of the Limerick seminaries who went on to Maynooth in 1886 appeared in the prize distinctions list of the following year in Maynooth, In 1887, Dishop O’Dwyer, with the intention of bringing the education of the future priests of the Diocese more directly under his control, purchased the former residence of Lord Limerick in Henry Street. History repeated itself and the Diocese and the Jesuits again parted the educational ways. The new school received its first pupils on January 9th, 1888. There was a three way division within the school, a day school, a boarding school, and a seminary for ecclesiastical students. In 1910, a classhall block was erected adjoining the existing building, and St. Munchin’s College was to remain at this location for a total of seventy-four years. However, by the 1940’s, it was clear that the lack of space in Henry Street was a major drawback. This was most obvious in regard to playing pitches; the long line of students winding their way to the pitches at Highfield on the Ennis Road was a familiar sight for many years. The lack of space also prevented any hope of expansion in Henry Street. It was thus decided to look for yet another home for the College. The search was more difficult than expected, with several sites being examined, only to prove unsuitable. Finally, Bishop Patrick O’Neill solved the problem when he suggested giving the land on which the Bishop’s Residence was located as the site for the College. His offer was accepted and the building commenced. In time, the College in Henry Street was sold, the school building was demolished, and their site is now occupied by the Garda Headquarters. The original building has been restored and is now known as Hibernian House. 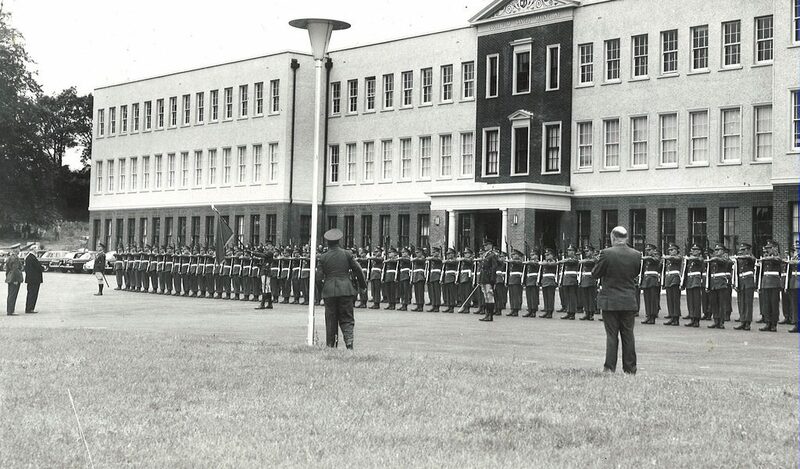 In September 1962, the new St. Munchin’s College at Corbally opened its doors to receive its first students, many of whom had already spent several years in Henry Street. The £440,000 cost of the College was raised in many different ways – Bingo, A/P Pools, Waste Paper Collections. This great Diocesan effort was masterminded by the late Fr. Tim Culhane. The formal opening of the new College took place on 28th. of August, 1963. A very large gathering, many of whom had contributed to the building of the College, watched as the Minister for Education, Dr. Patrick J. Hillery cut the tape. The celebrant of the High Mass was Bishop Henry Murphy, a former staff member of the College. Also present were more representatives of both Church & State, including President Eamon de Valera, who revealed that he had sat the entrance exam for St. Munchin’s College, but had failed to secure a place. The spacious site at Corbally, on the bank of the River Shannon, with room for several playing fields and stands of mature oak, beech, and chestnut trees was in marked contrast to the cramped area in Henry Street. With such a long and noble history behind St. Munchin’s College, it is only natural that the College has continued to prosper and expand. Since 1962, many more facilities have been added as the College has kept pace with the ever changing demands of education. New classhalls, a Computer Room, a new Library, and a Swimming Pool are among the additional amenities now provided for the students. The college has a student population of almost five hundred and twenty. Our past pupils continue to achieve distinction in all walks of life. It is, however, our past pupils’ affection for their ‘Alma Mater’ that is the real testament to the special position held by St. Munchin’s College in the field of education. Yes, St. Munchin’s College has seen many changes in its long and distinguished life, the most recent being the closure of the boarding school when the last 19 boarding students completed their Leaving Certificate Examinations in June 2004 but, what has never changed is its dedication to the highest standards and the care and concern shown by the staff for their students.